In the film Man of a Thousand Faces a dying Lon Chaney played by James Cagney signals for his son Creighton to hand him his make up box inscribed with his name and with greasepaint he adds “Jr.” to the “Lon Chaney”. A Hollywood film signalling the start of Lon Chaney Jr.’s career of putting crap on his face for the sake of film. The irony being that the mixture of a famous name, inheriting the endurance of painful make up techniques and being a hulk of a man. Chaney Jr. was either a monster or a goon for 95% of his career and the pressures of Hollywood turned him to a life reliant on alcohol. You almost think Lon Chaney Sr. would have served his son better if he left the make-up box as it was . No matter what, Lon Jr. always remained under his father’s shadow. Who was respected for playing tortured souls like Quasimodo and the Phantom and not just because he put on a lot of make up. Saying that, his career blossomed some what, he is the only actor to play four of Universal’s famous monsters, a vampire in Son of Dracula, the Mummy, Frankenstein’s monster and of course the Wolf Man. Playing The Wolf Man was one of the twelve step backs towards alcoholism. 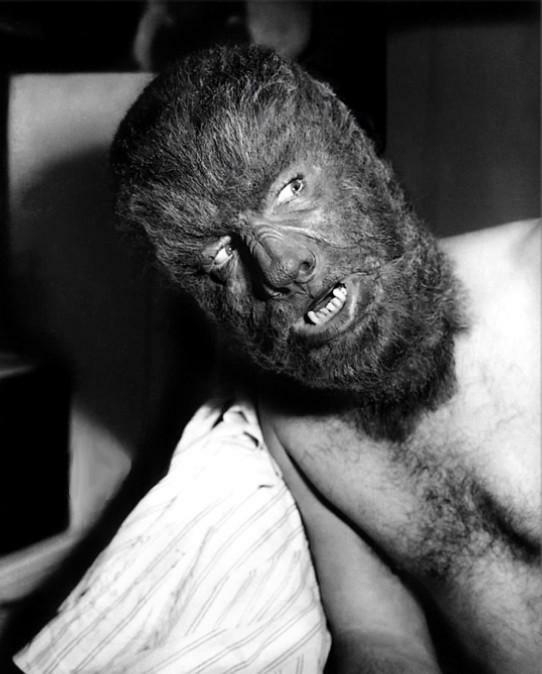 The make-up and effects in the film were gruelling 6 hours to put on 3 hours to take off, with some of the transformations in The Wolf Man series clocking up a shooting period of 24 hours. That’s 24 hours of Chaney Jr, lying down while they slowly add more and more hair and prosthetics to his face. Who wouldn’t want a tipple under those circumstances? It’s fair to say that Mr. Wolf Man was pretty drunk by the end of those transformations. Lon Chaney Jr.’s alcoholism became embarrassingly public knowledge when he turned up inebriated to play the monster in a live TV production of Frankenstein, you would think it’s a character where the actor could get away with playing it drunk, but unfortunately Lon thought the live broadcast was merely a dress rehearsal, so instead of smashing things up like the monster is supposed to do, he picked up chairs and carefully put them back down, apparently he can be heard mumbling “break later”. Lon Chaney Jr.’s career of playing scary things under layers of make up is bookended by two stand-out performances. Neither of them under disguise. Near the beginning of his career he played Lennie Small and near the end of his career he played Bruno in Spider Baby. And for me, Spider Baby is what I’ll remember him for. . 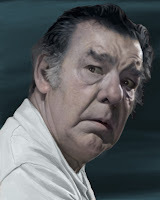 In Spider-Baby we see Lon’s character wear his heart on his sleeve as Bruno, the elderly carer for the children of the Merrye family, a family stricken with an unfortunate disease called Merryre Syndrome (not a coincidence), in which they devolve and regress mentally, socially and physically. His relationship with the children is interrupted by two distant relatives who feel they are entitled to the house and to put the children into care. Bruno’s desperation to keep the family together and cared for by him as promised to their parents knows no bounds and it’s in this he gives his most soulful performance. The alcoholism was public knowledge at this stage, although some crew members claim they never saw him touch a drop, others were well aware that the oranges he seemed to love so much were injected with hard liquor. That’s when you know an alcoholic has gone pro. Aware of his problem, ashamed almost, but still coming up with ingenious ideas of how to keep it up. Lon Chaney Jr. was hailed to be a child prodigy and like his father become one of the biggest stars in the world (Chaney Sr. was just behind Chaplin) and ended up being used and spat out by the industry that embraced his father so much. Only to end up being an alcoholic in low budget horror comedies like Spider-Baby, without make-up, playing the straight man to the monsters. The irony is how this was his best performance, though unfortunately not his swansong, he went on to star in several more films, his final role being, fittingly a supporting one in Dracula vs. Frankenstein. He died of heart failure aged 67. Seek out a copy of Spider-Baby and raise a glass to Creighton Chaney, the fallen prodigy. This entry was posted in Uncategorized and tagged alcoholism, horror, jack hill, lon chaney jr, spider baby, wolf man by Bren. Bookmark the permalink.